In this tutorial I will show you how easy it is to add text on top of a photo or image in Photoshop, how to change the colour, the font & size of the text and how to move and re-position the text box and center align the text. For this tutorial I have used a mountain photo, if you want to follow this tutorial and want to use the same image you can find it here or you can browse through one of these free stock photography sites to find your own image (or use your own lovely photography!). This tutorial has been written using Photoshop CC 2015. You will be able to follow the main parts of this tutorial in many past versions of Photoshop, including Photoshop 6 and Photoshop 5 as the main elements used in this tutorial haven’t changed. Choose the text tool (Horizontal Type Tool (T)) from the tool bar. and open the Character panel (Window > Character). Click on the colour that shows on the Character panel and use the colour picker to choose the colour you want to use for your text. You can also use the colour picker directly from the tool bar at the top of the screen. The text size and font will also be displaying in whatever was previously used. To change the font: Select the text tool from the tool bar again. 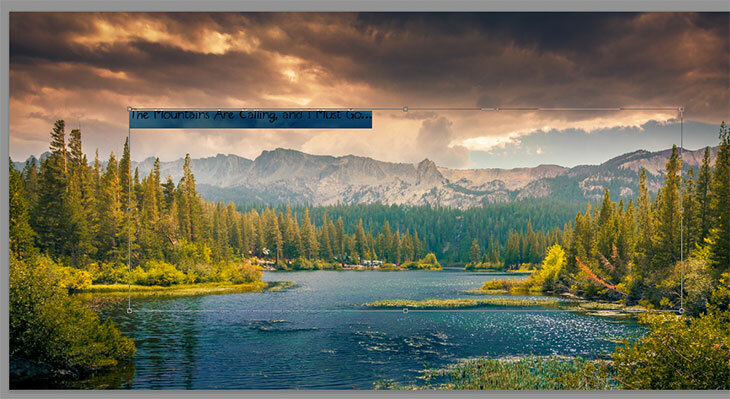 Click on the text on the canvas and the text box will re-appear.Click and drag from right to left over all of the text to select it. Using the tool bar at the top of the screen you can choose the font, size of text and also whether the text is left, right or center aligned within the original text box that you drew. You can also change all these settings in the character / paragraph panels. I have chosen to change the text to Fjalla One regular – this font is available from Google fonts. I have changed the font size to 150px (this figure will need to be unique to you as the size will be proportionate to the size of your original image) and I have changed the text to be center aligned within the text box. To move the text to the center of the image; make sure the text layer is still selected in the layers palette and choose the move tool from the tool bar. Click on the text and hold whilst dragging to it’s new position. With my particular text box, my center alignment doesn’t look right. I want the text to be centered horizontally so on the last step I placed it into position as best I could. To change the actual text box shape so that you can line it up against other elements you need to select the text tool and click on the text again. As I want the text to be centered horizontally I am going to align the text box with the left and the right of the image. To extend the left side. Hover over the middle point of the box on the left and you will see the cursors change to arrows. Click and drag to the new position and repeat for the right of the text box. You can now use the arrow keys to move the text up or down so that it looks centred vertically. To do this you can again select the move tool from the toolbar and with the text selected in the layers palette use the arrow keys on your keyboard to move the text. By pressing the arrow key once it will move your text by 1 pixel. If you hold shift whilst pressing the arrow keys it will move the text 10 pixels at a time. You should now be able to add text to a photo, change the font, the size and the colour and change the position of the text and the text box itself. If you found this tutorial helpful I always appreciate a comment below, or a tweet, a like or a pin! If you want to stay up to date with my new tutorials you can follow me on Facebook, Twitter or Pinterest.